Thériault, Michel. "Benedictines". The Canadian Encyclopedia, 15 December 2015, Historica Canada. https://www.thecanadianencyclopedia.ca/en/article/benedictines. Accessed 24 April 2019. 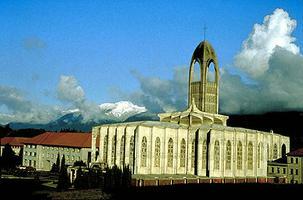 Exterior view of the Abbey Church, designed by Dom Paul Bellot, a Benedictine monk (courtesy Dan S. Hanganu). Various monastic traditions were already in existence in western Europe when Saint Benedict of Nursia founded the Abbey of Monte Cassino in Italy in 529. His rule, which quickly replaced most others in Western monasteries, is known for its moderation and flexibility. As a consequence, various branches of the order, each very different from the others and composed of autonomous houses, were formed over the succeeding centuries. Those represented in Canada are, in chronological order, the Congregation of Saint Gertrude the Great (Winnipeg, 1905, female); the American Cassinese Congregation (Muenster, Saskatchewan, 1908, male); the Congregation of France (St-Benoît-du-Lac, Québec, 1912, male; Ste-Marthe-sur-le-Lac, Qué, 1937, female); the Benedictine Federation of the Americas (Ladner, BC, 1939, male); the Benedictine Nuns of Mont-Laurier, Qué (became Benedictine in 1949); the Benedictines of Saint Lioba (Vancouver, 1951-68, female); the Benedictine Nuns of the Precious Blood (Joliette, Qué, who became Benedictines in 1974); and the Benedictine Community of Montréal (1977, male). T.Kardong, The Benedictines (1988); H. van Zeller, The Benedictine Idea (1959); .